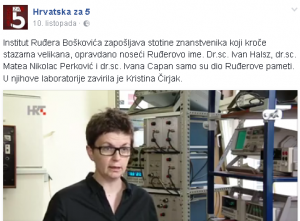 Ivana Capan (RBI) gave an interview for a TV show “Hrvatska za pet” (HTV1, 07.10.2016). The topic was “Outstanding researchers, innovators and educators changing society”. e-SiCure project was singled out as a good example. You can watch a video on Facebook.